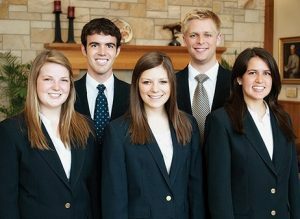 Jared C. Colton (’14), a senior in accounting from Johns Creek, Ga., will serve as president of BYU Student Alumni during the 2012–13 school year. Colton became involved in the organization following his mission and has been active in etiquette and networking events. He also served on the Student Advisory Council. During his year as president, he will work with BYUSA and Y Serve, two other major student organizations. “We will be positioned as the professional-development side of that triad and help connect students and create traditions for now and the future,” he says. The Student Alumni leadership team for 2012–13 includes, from left, Ellie Ott, Jared Colton, Erika Nash, Andrew Bressler, Megan Hirschi, and Brielle Porter (not pictured). of Utah, finals survival kits, Parents Weekend, and etiquette dinners. Serving with Colton will be executive vice president Erika J. Nash (’13), a senior in business management from Salt Lake City, and four vice presidents: Brielle Porter (’13), a senior in teaching social science from St. George, Utah; M. Andrew Bressler (’13), a senior in molecular biology from Rexburg, Idaho; Megan R. Hirschi (’13), a senior in biochemistry from Milton, Ga.; and Ellie A. Ott (’15), a sophomore in industrial design from Holladay, Utah.